St Mirren have completed the signing of 22-year-old former River Plate and Helsingborgs midfielder Franco Miranda. Irish defender Joe O'Cearuill remains on trial, but midfielder Phil Mulryne has failed to win a contract. Manager Gus MacPherson told his club website: "I'm glad to say that international clearance has now been granted for Franco Miranda. "We're delighted - especially for Franco as the process has dragged on quite a bit." Red tape had prevented the 22-year-old Miranda being available for last weekend's SPL opener against Motherwell. 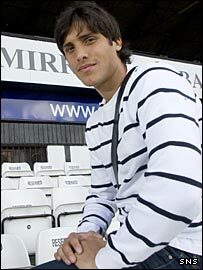 The Argentine started his career with CAI in his homeland before joining River Plate, then Racing Club before his move to Sweden but has now been released by Helsingborgs. Miranda is the first non-European to be signed by MacPherson, who believes that the player's talent will justify the frustrating wait. "I feel that what Franco will bring to the club is something we have maybe been lacking since Simon Lappin left," said the manager. "He is a left-sided player who can play as a full-back, wing-back or midfielder. "And, with the injuries to Ian Maxwell and Eddie Malone, we are a wee bit short in left-sided defenders, so his arrival gives us some competition for the left side of the park." St Mirren make the short journey to Ibrox to face Rangers on Saturday. "We have made all our preparations and game-plan, so the clearance may have come in just a bit too late," said MacPherson. "But, having said that, he may still come into contention." MacPherson decided against signing Mulryne, capped 25 times for Northern Ireland, who was hoping to resurrect his career with St Mirren. Are you excited by St Mirren's latest signing? The 28-year-old began his career with Manchester United before spells with Norwich City and Cardiff City. His career was in turmoil after being ejected from the international squad for a breach of discipline in 2005. Mulryne was released at the end of the season after a short spell with Leyton Orient and had a trial with Bournemouth. "We'll not be taking our interest any further with Phil Mulryne, but we will have a further look at Joe O'Cearuill over the course of next week," said MacPherson. O'Cearuill was released by Arsenal at the end of season after a spell on loan with Brighton. The 19-year-old, who had started his career with Orient before heading for Watford, made his full international debut for the Republic of Ireland in May.